As the pace of technology progresses rapidly, it has become vital for CIOs and IT leaders to keep an eye out for transformative technologies that help increase efficiency, drive revenue, and more. Thus, since 2010, we have asked interviewees on Metis Strategy’s Forum on World Class IT podcast series to provide their thoughts on upcoming trends in IT; our team has tracked the results and elucidated several interesting patterns, some of which will be highlighted in this paper. Overall, 51 individuals, ranging from active CIOs, CTOs, CEOs, CFOs, CAOs, professors in IT-related fields, among others, provided their input concerning future trends. The graphs in this article demonstrate which areas IT thought leaders believed to be most compelling in the near future. Figures 1 and 2 illustrate the top trends identified over the course of the podcast series, and consist of some of the “usual suspects” such as cloud computing, mobility, etc. Figure 3 provides a breakdown of trends identified in 2010 vs. 2011, and Figure 4 takes the data a step further to demonstrate the change in percentage of identified trends. Together, these charts convey some interesting revelations, such as the emergence of trends like the consumerization of IT, the increased role of IT in the business, and the power of computing, as well as the decline or stagnation of trends such as social media. Although the identification of prominent and emerging trends provides interesting food for thought in itself, simply identifying trends without a broader context does not do the insights justice; thus, this article will further build upon these insights and present context concerning the emergence, decline, or persistence of specific trends in order to provide IT leaders greater visibility into what technologies will gain a foothold and should be considered sooner rather than later. Where the chart above provides the number of interviewees identifying trends, the chart below demonstrates trends identified as a percentage of interviewees. The top few trends identified by the podcast interviewees, as shown in Figure 1 and Figure 2, have been prominent in the IT realm for some time, and for good reason. Cloud computing, which essentially provides shared resources, software, and information on demand, enables increased flexibility in IT spend, as it entails not only a significant reduction in fixed costs, but the ability to focus time and resources on better supporting the business and aligning to their objectives, a proposition tantalizing to many CIOs. For example, Curt Edge, CIO of The First Church of Christ, Scientist, states that “about 4-5 years ago [prior to moving to the cloud], we spent about 80% of our time working on maintenance …today we spend anywhere from 60-65% of our time working with the businesses. ” It should be noted that some of the identified trends, such as Software-as-a-Service (SaaS) and virtualization remain closely linked to cloud computing: virtualization enables the movement of major infrastructure components to the cloud, and SaaS essentially acts as a subset of cloud computing, with software and associated data being centrally hosted in the cloud. For the purposes of this paper, these trends will be treated as distinct entities despite their linkage. As mobile technologies improve at a rapid pace, employees have the ability to utilize mobile devices to conduct business and access internal networks, so that they may be productive anywhere. For instance, David McCue, CIO of Computer Sciences Corporation, states that “we’re all beginning to appreciate what the convergence of the last few years of ubiquitous available bandwidth, thick pipes, and powerful handheld devices means…we’ve learned that being able to do anything, anytime, anywhere is the direction we’re going. ” Furthermore, what has partially enabled the advent of mobility has been the consumerization of IT, where a plethora of ever-improving mobile computing devices such as smartphones and tablets have begun to permeate the business world. Taken together, these trends do not seem surprising at all, as they have been widely recognized in a variety of publications and numerous companies have begun implementing projects in relation to them; however, further delving into the data provides significant insights into the shifting priorities of IT leaders (see Figure 3 and Figure 4). Evidently, the data illustrates significant changes in trends identified between 2010 and 2011. Figure 4 provides the difference in percentage from 2010 to 2011, and reveals several interesting details concerning trend trajectories. First, the number of interviewees identifying social media and collaboration technologies (both internally and externally facing) as a major IT trend decreased dramatically; over the past two years, this trend dropped from first to fourth overall (see Figure 1). So, what has caused this dramatic decrease in recognition? Some plausible explanations include the increased awareness of social media platforms, such as Facebook, that were more front-of-mind due to their exponential growth in use by the general population, or by the significant level of media exposure these platforms received. Another explanation could be that organizations recognized the potential of these platforms early and sought to implement technologies to take advantage of them. For instance, Microsoft witnessed a significant increase in sales of SharePoint  (which enables collaboration), indicating that more companies have sought this type of solution, and have addressed this trend. On the flipside, however, as detailed in a recent InformationWeek article, numerous internal social networking initiatives have faced lackluster adoption  ; one possible consequence could be that IT leaders have shifted focus elsewhere. Whatever the explanation, this precipitous decline in focus on social media remains an interesting topic that merits further monitoring. It comes as no surprise that consumerization of IT, which concerns the impact that consumer-originated technologies have on enterprises, has witnessed the greatest increase in being identified as a trend from 2010 to 2011. The rise of tablet technologies likely acts as one of the primary drivers for this increase, particularly the release of the Apple iPad. Although consumerization of IT has been increasing in prominence as consumer technology becomes more sophisticated, it appears that the release and the widespread adoption of the iPad (approximately 55 million sold to date  ) has opened the floodgates and has caused this topic to considerably rise in prominence. In fact, Metis Strategy has advised several clients who have sought to implement tablets within their own organization in recent years; overall, despite concerns of security of information in adopting tablets and other consumer originated technologies, the majority of organizations have found benefits through a combination of increased productivity, employee satisfaction, and reduced cost. Furthermore, as the capabilities of consumer technologies expand, we have also seen an increase in organizations employing “Bring Your Own Device” programs, which leverage not only the familiarity employees have with their own devices, but the reduction in support necessary for these devices. For instance, Bruce Leidal, CIO of CareStream Health, states that “people own their own devices and they would just as soon use those for work…and we’re putting in the right infrastructure so that we can make sure that that happens. I think the benefits [are that] we have basically eliminated all of the support costs…it reduces our call volume and also takes a lot of noise out of our support environment. ” Thus, overall, the rise in consumerization of IT makes sense given the parallel advancements and capabilities of consumer technology. An additional trend that is rising in prominence includes an increased IT role in the business. In numerous organizations Metis Strategy has advised, IT has historically been regarded as an “order-taker”, and not seen as integral to driving the business; however, as technology becomes vital in how business operates in contemporary times, we have begun to see a shift towards increasing IT involvement in the business. Although this trend has yet to become pervasive, it appears to be a logical successor to other prominent trends. For instance, we have seen several of our clients try to unburden their resources by adopting cloud computing solutions, significantly increase virtualization, or leverage consumerization of IT programs such as ‘Bring Your Own Device’; not only do these initiatives decrease fixed costs related to hardware, but they drastically reduce ongoing maintenance and support of the hardware. Consequently, IT employees have increased opportunity to partner with the business so as to focus on value-oriented and revenue driving initiatives. For example, Jim Knight, EVP and Global CIO of Chubb & Son, states that “what we have found the last couple of years is not only are we the fuel for managing expenses…we’re also the engine for the business…because technology can get us there…there are absolutely expectations of us that our operations will be streamlined and [as] cost-effective as possible, but they are also investing in programs to bolster up the business. ” In addition, as the general consumer of technology becomes more tech savvy, it becomes necessary for businesses to connect with these consumers utilizing the same technology; as a result, IT can naturally team with other functions to drive business’ strategy through leveraging new tech-enabled customer touch points. The ability to process and analyze massive amounts of data, currently referred to as Big Data in IT circles, to form conclusions that can be acted upon will be invaluable, allowing businesses to discern customer behavior and other patterns. One of the reasons why this capability will be so valuable derives from the fact that many correlations that can be discovered through this type of analytics are not intuitive in nature. For instance, the New York Times recently published an article detailing how Target was able to utilize statistical correlations to predict which of its consumers were pregnant, and thus create tailored promotions to that demographic; other correlations included finding that newly-married individuals are more likely to begin purchasing a new type of coffee, or when individuals divorce, they tend to change brands of beer . These behaviors do not appear to have inherently intuitive explanations, yet they exist and can be discovered and leveraged through analytics as enabled by computing power. Thus, the rise in the power of computing, and the correlated capability to conduct extensive analysis to discover valuable insights, will become a source of competitive advantage in the future, and likely explains why this trend has been increasing in prominence. The analysis of the data obtained from the Forum on World Class IT podcast series reveals interesting insights concerning the trends that are front of mind for IT thought leaders. Not only does the data point to top trends such as cloud computing and mobility, but it also demonstrates trends rising in prominence such as consumerization of IT, the power of computing, and the increased IT role in the business, as well as trends on the decline such as social media. From Metis Strategy’s perspective, we feel that IT’s increased role in the business, as well as the power of computing and analytics, will continue to be pertinent for business leaders, and will rise in prominence in the coming years. As many resource-consuming aspects of IT move to the cloud, such as purchasing and maintaining servers, network equipment, data center space, business applications, etc., IT organizations will thus be able to focus more on driving business strategy. One method of IT supporting the business, as we have seen in several organizations, entails enabling a strong business intelligence function, which is closely associated with the power of computing and analytics. As the amount of consumer information gathered and analyzed continues to grow, it will become essential for IT to develop methods to effectively consume and utilize this information to influence business decisions. We feel that consumerization of IT, although experiencing a drastic increase in recognition in recent times, will level out somewhat. This is not to say that this trend has been ‘over-hyped’, but that the advantages of consumer-originated technology entering the business landscape have become much clearer recently, and many of our clients actively pursue opportunities to incorporate these technologies in their businesses. Similarly, when considering cloud computing, we feel this trend will begin to even out in the near future; cloud computing has been a topic of discussion among IT leaders for several years now, and we have begun to observe numerous companies moving ‘to the cloud’. In the coming years, cloud computing will be in essence ubiquitous, less of a consideration and more of a necessity, and will be intrinsic in how IT operates. Overall, these insights bolster the notion that the landscape of IT continuously shifts and progresses at a rapid pace, and it becomes ever more important to keep our fingers on the pulse of IT and understand how these constantly emerging innovative technologies can be harnessed to propel business to a new level. Furthermore, what is truly exciting about all of these mentioned trends is that the majority of them provide tremendous opportunities for CIOs to collaborate with peers across the company, putting IT in the center of interesting conversations that could determine business direction. These trends have deep-seated business implications that should be taken advantage of to increase the curiosity and enthusiasm about how IT can help drive the business as opposed to merely supporting it. Peter High, “Metis Strategy’s Forum on World Class IT,” podcast interview with Curt Edge, March 26, 2012. Peter High, “Metis Strategy’s Forum on World Class IT,” podcast interview with David McCue, April 9, 2012. Healey, Mike. “Enterprise Social Networks: Dislike,” InformationWeek, February 2, 2012. Sam Gustin, “How Many iPads Can Apple Sell?” Time Business, March 16, 2012. Peter High, “Metis Strategy’s Forum on World Class IT,” podcast interview with Bruce Leidal, November 21, 2011. 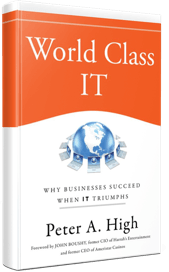 Peter High, “Metis Strategy’s Forum on World Class IT,” podcast interview with Jim Knight, January 3, 2012. Cade Metz, “IBM Busts Record for ‘Superconducting’ Quantum Computer,” Wired Enterprise, February 28, 2012. Peter High, “Metis Strategy’s Forum on World Class IT,” podcast interview with June Drewry, December 5, 2011. Charles Duhigg, “How Companies Learn Your Secrets,” The New York Times, February 16, 2012. Please visit The Forum on World Class IT to listen to the podcasts and trends mentioned in this article.